Is window shopping your thing? If so, you might like what BrowseGoods has to offer as it recently launched a new way to shop online. Rather than searching directly for the items you are looking to buy, BrowseGoods allows you to casually browse for items. 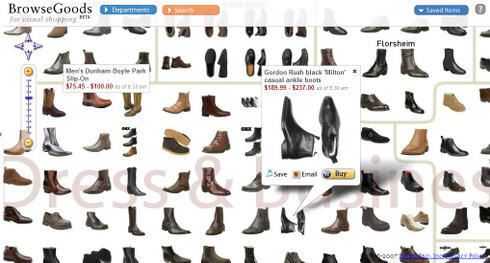 BrowseGoods enables users to shop visually by browsing over a number of items in a handful of categories. BrowseGoods is not a visual search in the same sense as Like.com which actually returns search results based of an image. Instead, BrowseGoods incorporates an drag and drop interface, similar to any Ajax map product, which allows users to easily move across a number of items very quickly. If you find something you like you can save it for later, email it to a friend or buy it immediately from Amazon.com. The screen-shot below was taken as I browsed the men's shoe selection. The BrowseGoods experience may be something worth giving a try, especially if you don't quite know what you are looking to buy. For other perspectives check out Search Engine Journal, TechCrunch and Ajax Magazine.